I finally decided to participate in Inktober after years of wanting to participate but letting life get in my way. In preparation, I decided to write down some brief thoughts on some of the pen and ink instructional books that I’ve collected. Reviewing these books has been helpful and inspiring as I plan out my inking activities for this coming October. 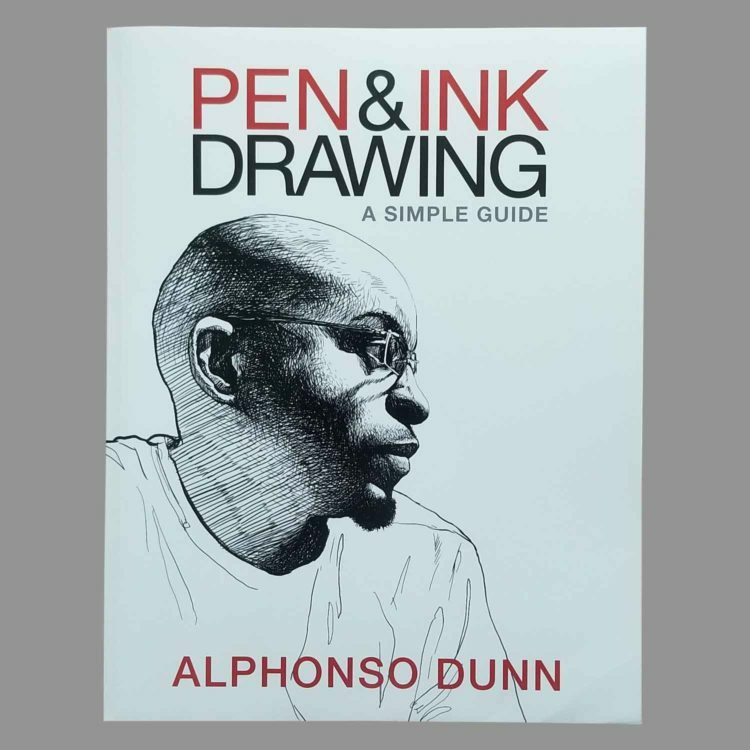 Pen & Ink Drawing: A Simple Guide by Alphonso Dunn. This is the most recently published book out of all of these. The author’s passion about the topic comes through so strongly when reading this book. 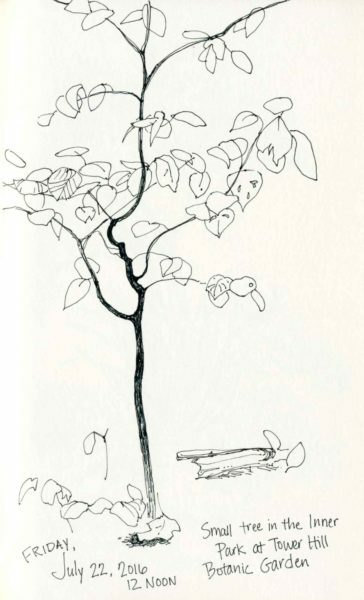 There is a lot of basic drawing instruction included, such as info on value, form, and composition. 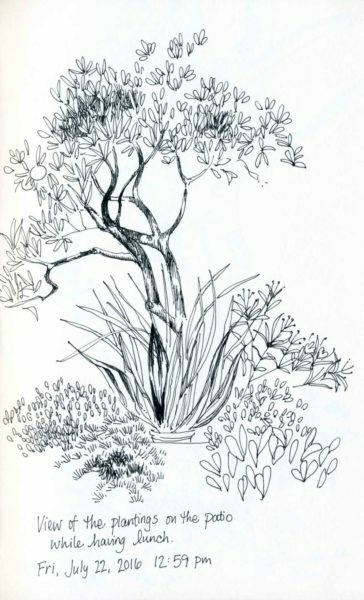 There is also a chapter on sketchbooking, where the author shows examples of his own sketches. One thing that I thought was interesting was that the drawings seem very “soft,” as if drawn with pencil. Looking closely, I tend to think that this has to do with how the art was reproduced. I highly recommend checking out this book as well as Dunn’s expansive YouTube channel. Dunn also came out with a companion workbook which I haven’t gotten a chance to see yet. Creating Textures in Pen & Ink with Watercolor by Claudia Nice. This book and the following one are very similar but Nice’s work always made me smile so I decided to get both books and see what the differences are. One of the main criticisms of Nice’s books on Amazon was that same content has been recycled and used in several books. I didn’t specifically notice that with these two books, although there was some overlap. One thing that really distracted me throughout both of these books was the odd style of handlettering. I would have much preferred a standard printed font for ease of reading. I enjoyed the wide variety of subject matter with quite a bit of still life material. 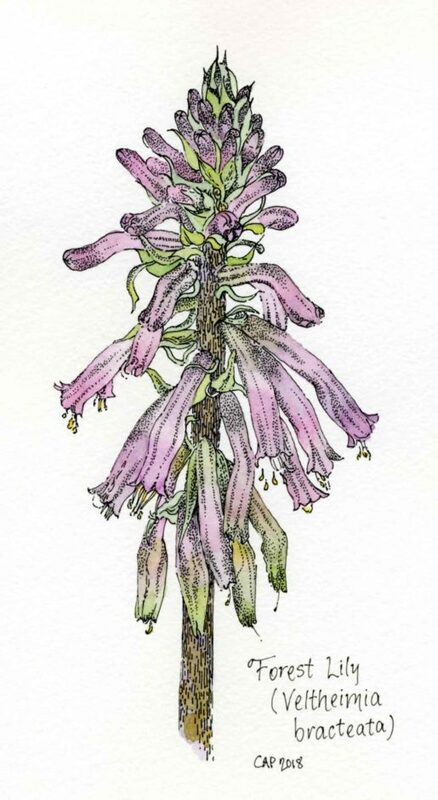 She also uses colored inks in some drawings. Nice uses rapidograph pens almost exclusively. Creating Textured Landscapes with pen, ink and watercolor by Claudia Nice. In the previous book, Nice focuses on capturing textures of a variety of man made and natural substances. In this book, Nice shifts her focus to nature and how to incorporate the different elements into a landscape style painting. 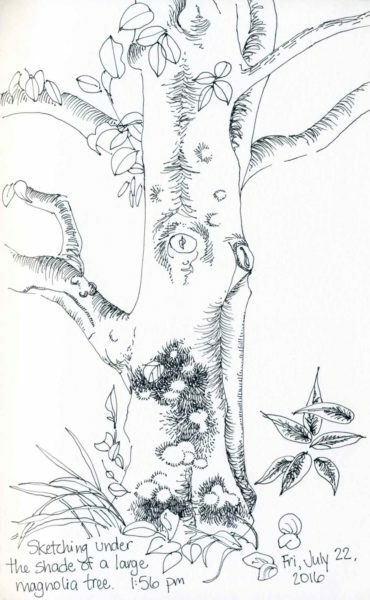 There seems to be more watercolor content in this book, and more pen and ink material in the former. There is one chapter devoted to incorporating architecture into the landscape and covers perspective nicely. The landscape format of the book also seems to fit nicely with the subject matter. I’m not sure which book I prefer more; I’m glad I got both. The Technical Pen by Gary Simmons. Although this book is specific to technical pens (rapidographs), it contains a lot of helpful information for general pen and ink drawing. Disposable fineliners like Microns have similarities to technical pens so a lot of the demo illustrations wouldn’t necessarily have to be done with a technical pen. 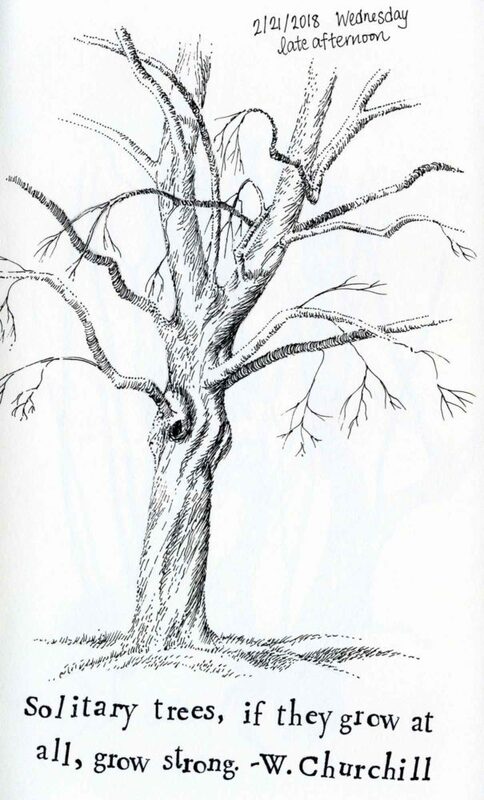 Many of the drawings are highly stylized and have more of an illustrative quality. My favorite part was when the author redid the same drawing several times using different types of pen strokes to show the variation possible. There is a good mix of “tight” and “loose” drawing styles. 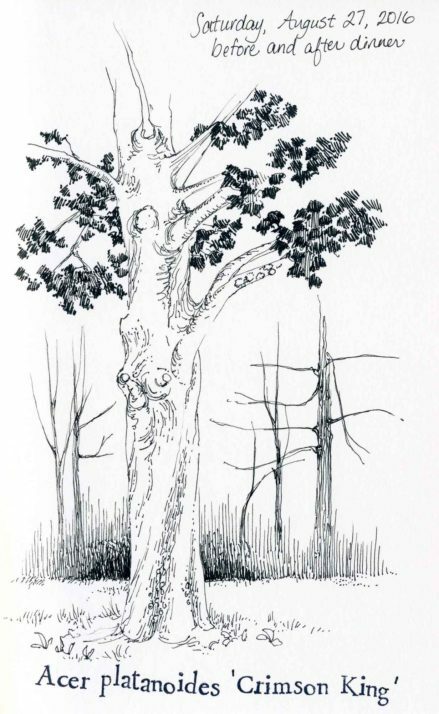 Rendering in Pen and Ink by Arthur Guptill. I’ve had this book for years and it never fails to inspire. It’s such a classic. I love that in addition to showing many drawings, the author analyzes them and explains what works and what could be improved. There are also sample artworks from different artists, not just the author of the book. It’s really heavy on architectural drawings but there are natural elements incorporated within them. There are also a fair number of portraits included. Pen & Ink Techniques by Frank Lohan. This book has some good info about planning out the drawing, including matting, and has some very useful suggestions about avoiding common errors. Demos have step by step instructions which makes this book a good choice for a beginner. I wish this book featured less architecture and more natural elements. This was also the shortest book out of all of them. Stay tuned for more pen and ink themed goodness (naturally). 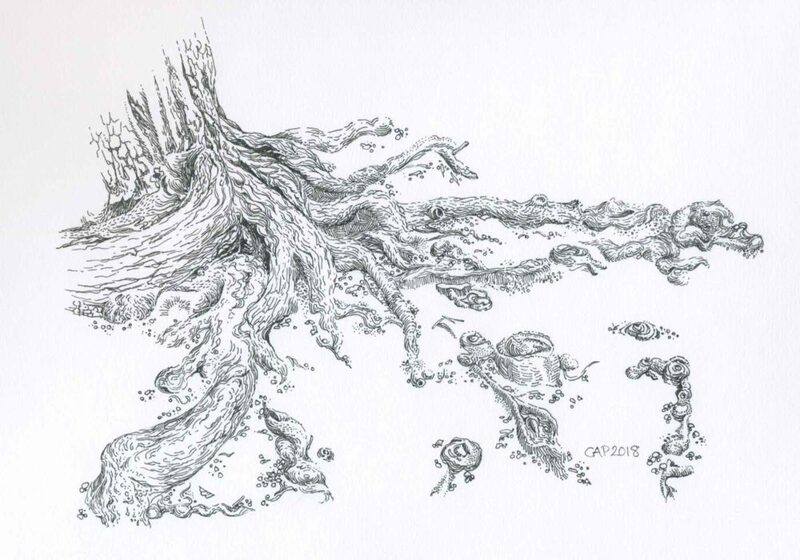 If you know of any other useful pen and ink books or resources, please let me know in the comments and I’d love to check them out. ©2017 Carolyn A Pappas, Exotic Swimming Hole. Ink, watercolor, and Inktense colored pencils, 7 x 5 inches. A friend of mine took a trip to Mexico a few years ago and gave me permission to make a painting from one of his snapshots. I have been planning to make this little painting for ages now, but never got to it until now. I haven’t traveled in the past several years, but someday I would like to visit some beautiful locations and make some paintings like this in person. I used a Pigma FB brush pen and went over it with juicy watercolor and some Inktense colored pencils. I removed all the people and buildings from the picture because I wanted a more peaceful and natural looking scene. This little painting was a lot of fun! ©2016 Carolyn A Pappas, Slow Sketch (5/10/2016). Ink in large moleskine. 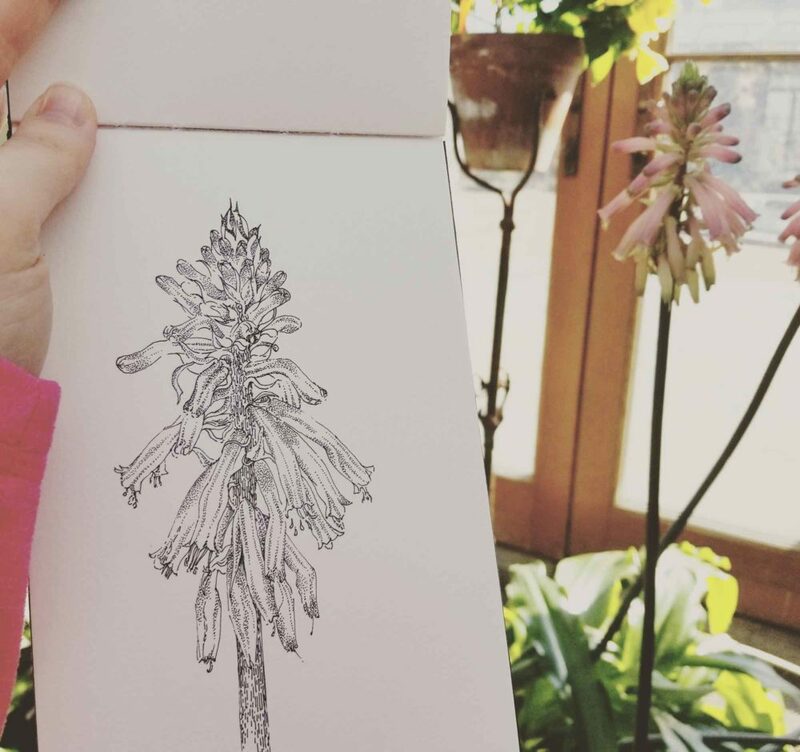 I’m looking back into my sketchbook from one year ago today. 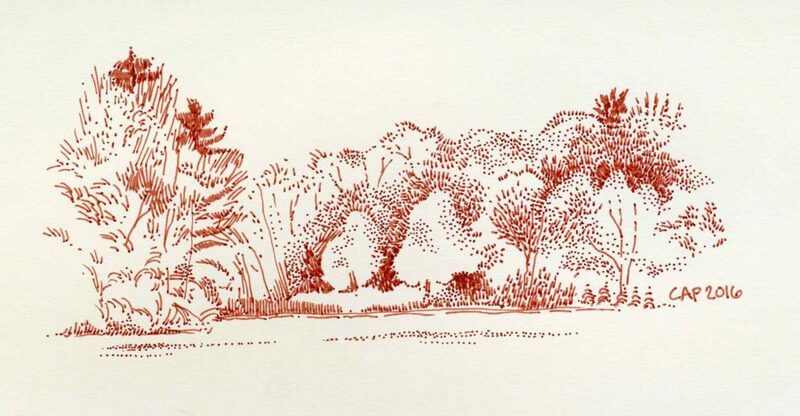 I made this little sketch while sitting on the wall by the shoreline looking out over the lake. The weather was very pleasant and I remember taking my time making the individual marks with the pen. On that day I had no commitments and nothing special to do. It was lovely. 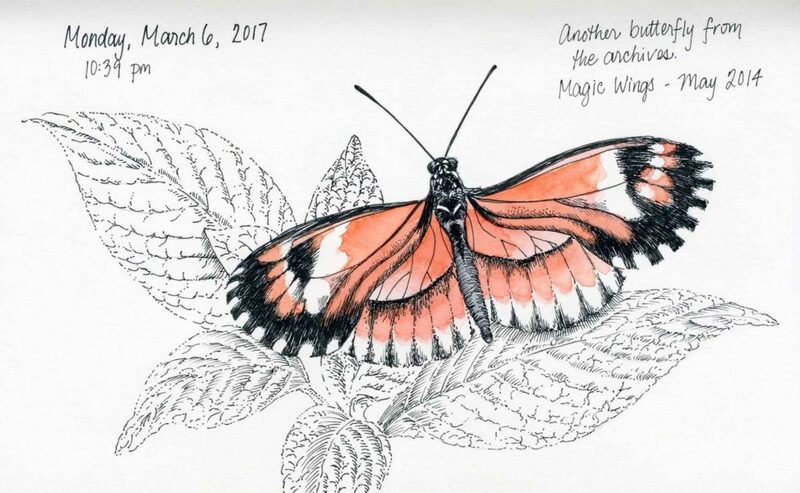 Over Spring Break I delved into my reference photo archive and sketched some butterflies. I have a nice collection of photos, some from the butterfly conservatory and some from outside. 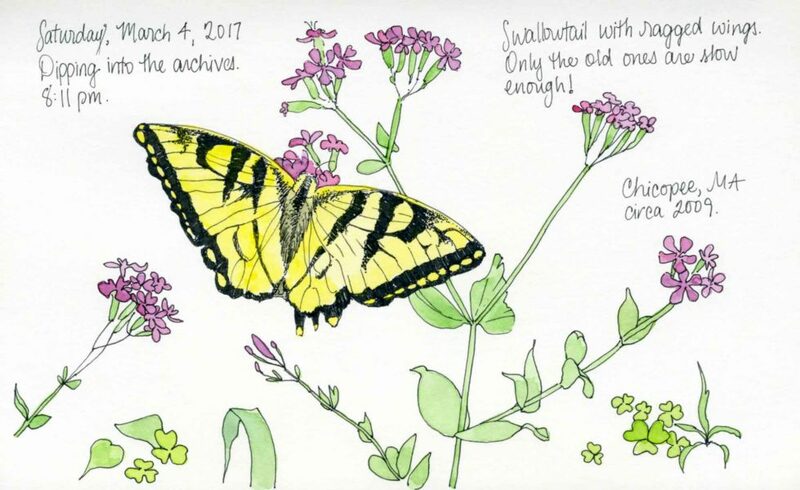 I tried to identify the butterflies in the last two sketches but had no luck. I did waste a few hours looking at photos of many beautiful varieties though. ©2017 Carolyn A Pappas, Swallowtail with Ragged Wings (3/4/2017). Ink and watercolor in large moleskine. ©2017 Carolyn A Pappas, Orange, black, and white butterfly (3/6/2017). Ink and watercolor in large moleskine. 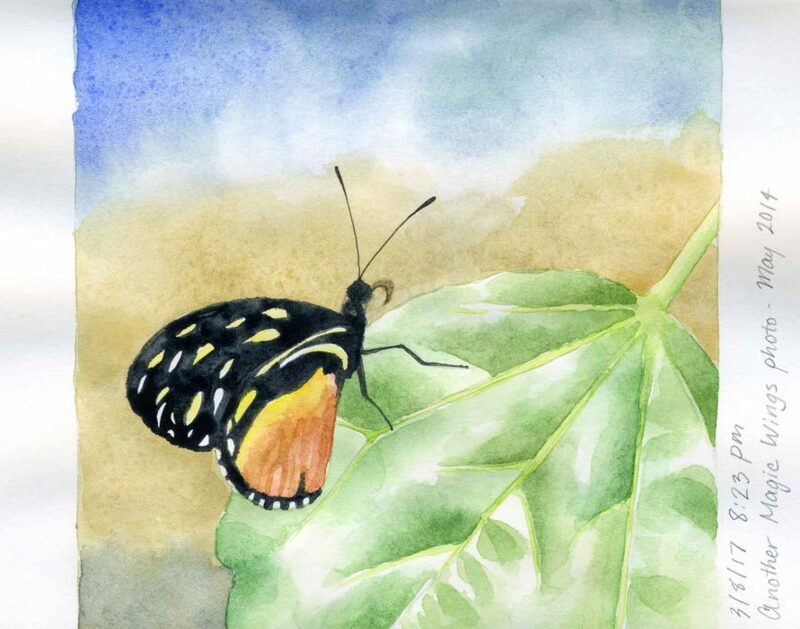 ©2017 Carolyn A Pappas, Watercolor butterfly on leaf (3/8/2017). Watercolor and ink in large moleskine. ©2016 Carolyn A Pappas, Roadside Sketch (8/27/2016). Pen and ink in large moleskine. ©2016 Carolyn A Pappas, Acer Platanoides ‘Crimson King’ (8/27/2016). Pen and ink in large moleskine. 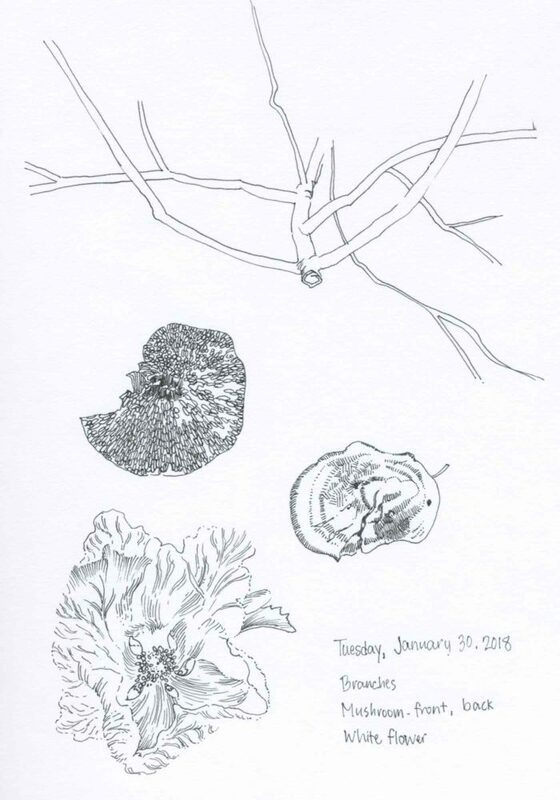 These are some pen and ink sketches I made while sitting on the porch of a beautifully renovated old farmhouse. The late afternoon/early evening light made it a very interesting landscape to draw and observe. 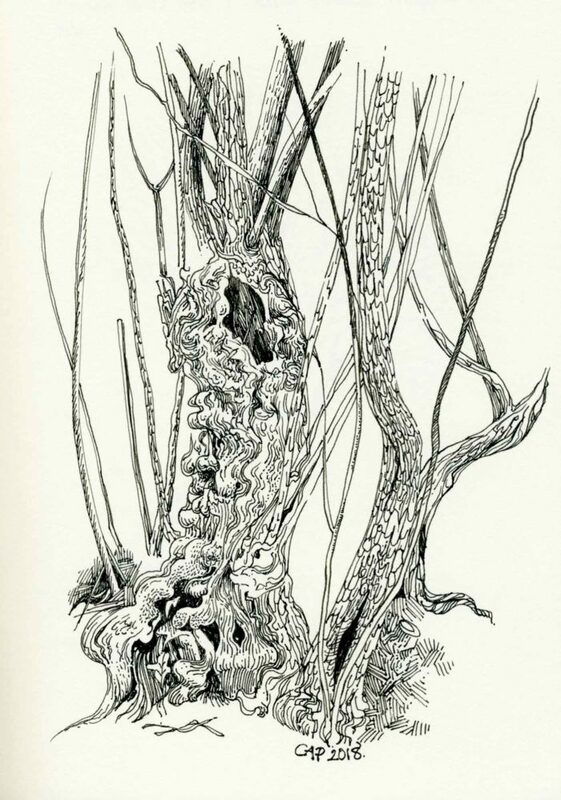 When I was drawing the wires (not accurately, of course), I remembered this informational blog post from James Gurney, although I didn’t recall the specifics. 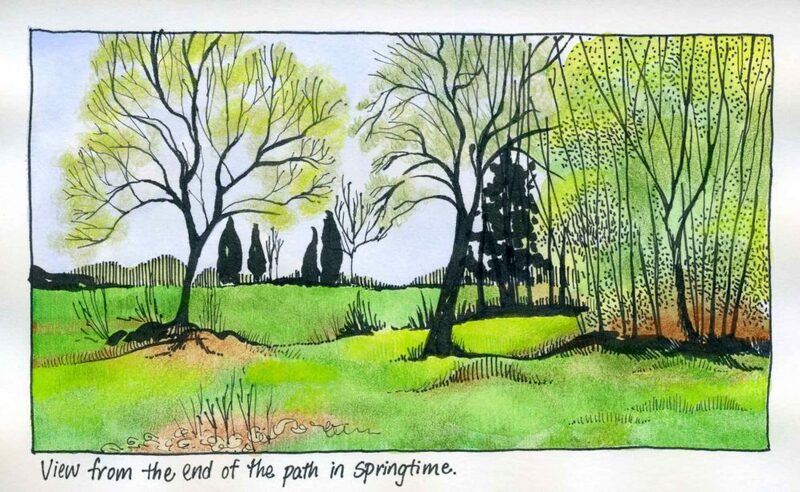 ©2016 Carolyn A Pappas, View from the end of the path in springtime. Ink, watercolor and colored pencil in large moleskine. Interestingly, I just came across this blog post from Brenda Swenson, where she discusses taking risks and trying out new things. *I found that the Pentel Pocket Brush Pen bleeds a bit on the new moleskine paper and saturated both sides of the paper, but it did not soak through to the page underneath. I was able to get out of the house by myself for a few hours today. I used my time well and made three sketches. It was lovely. 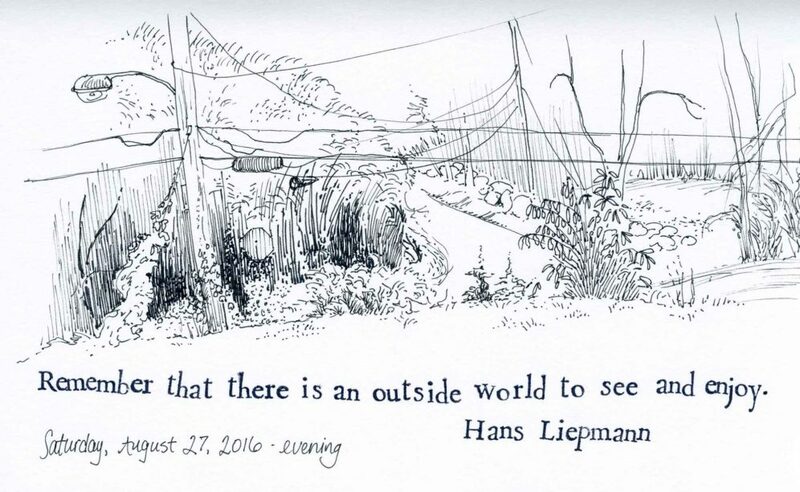 ©2016 Carolyn A Pappas, Inner Park Sketch (7/22/2016). Ink in large moleskine. ©2016 Carolyn A Pappas, Lunchtime Sketch (7/22/2016). Ink in large moleskine. ©2016 Carolyn A Pappas, Magnolia Tree (7/22/2016). Ink in large moleskine.